Each Saturday this year, I will be posting a weekly habit. During my 31 day's series, I talked about a lot of theoretical and how to create purpose in your home. It was about you figuring things out, making goals, and knowing why you are doing the work, now it is time to put them into action. 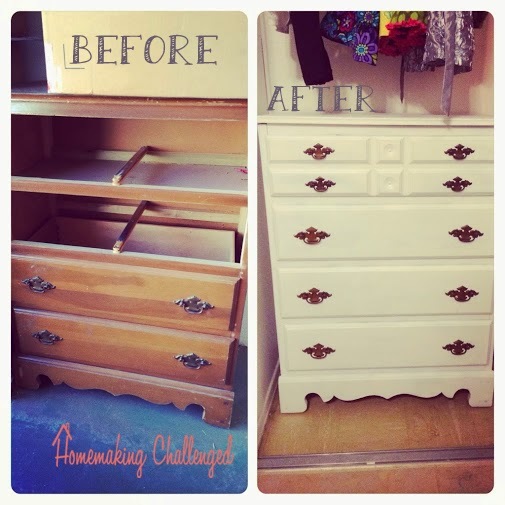 Each week I will add one new habit to help you become less homemaking challenged. The objective of this? By the end of the year, for us to have applied several of these habits in our daily/weekly routine and be less homemaking challenged by the end of the year! I don't know if you are like me, but I come up with great ideas, things I need, and remember important things at the most inopportune times. Always when I am in the middle of something and always when I am never able to write it down. I try and make a mental note, but I have to say that most of the time my "mental notes" manage to get lost in my sleep deprived brain full of baby needs, work and more work. I have learned that if I don't actually physically write something gone, it is gone for good. So weather it is a shopping list, a calendar, a great idea, something you want to remember write it down. You get it, make sure you have a place to write stuff down wherever you are. Miss a week? Here are the past 52 Weeks to Become Less Homemaking Challenged, so far clickhere to see a full list. Hope you all have a great week this week! Calendars are really important to life. Even if you aren't a "schedule" person, they are important. We have a family calendar that hangs on the inside of one of our cupboards. Not everything is on it, and by that I mean things we do EVERY week are a given and not on the calendar (such as going to church on Sunday, or my usual office hours). You can use whatever type of calendar works for you, a paper one like this, or this for your personal use and then a wall one, perhaps even a whiteboard or chalkboard calendar is more your taste. Whatever your style, find one that all adults and children who are old enough can read and know what is going on, and make sure you have one that travels with you!. This way, you can prevent scheduling a late date night when you have soccer pictures the next morning and have to have the kids photo ready and out the door by 7am. Also, don't forget to sync your personal and family calendars, if you are a digital person that happens automatically, but I'm a pen and paper person, so I do mine by hand. Miss a week? 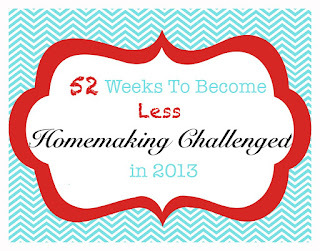 Here are the past 52 Weeks to Become Less Homemaking Challenged, so far click here to see a full list. Just those two words can send a shiver down any mom's spine. It is exciting because it means less diapers, but it is also scary, because there are an overwhelming number of tips, and tricks to try and do this thing. Goggle it. Everyone seems to agree that there are signs for readiness but the methods very so greatly, it is ridiculous. I really could go on, but what is the point. There is too much advice to handle. We have been taking the "fun" "non-serious" route. For the last several weeks, my two year old has been happily sitting on his potty, and asking to go potty. For months he has been telling us he was wet or pooppy. We bought him some big boy undies awhile ago. A few weeks ago, we tried to get him to go potty and wear them. Even with putting him on the potty every 15 minutes he went through 3 pairs in an hour. I stopped pushing. Just had fun with it. Going potty every once in awhile, and trying, but nothing ever happened. However I did manage to convince my husband that he was READY to potty train. Yesterday he sat on the potty wanting to go so bad. Seriously this kid sat on the potty for like 30-45 minutes. Nothing happened, but he really wanted to! I told Matt that as soon as he does his business on the potty, he will have it figured out, and we will need to be ready to take training seriously. I took him expecting him to sit for 5 seconds play with toilet paper and flush (what a typical "trying" looks like. However, he sat and peed on the potty for the very 1st time. He got it. *cue the hallelujah chorus* I mean he really got it! It helped that there were lots of people to reinforce him for the 1st time (mommy, daddy, baby sister, as well as, my parents, grandparents and cousin). Then he did his typical "trying" two more times at grandma & grandpa's before I convinced him we could try again at home before bed. When we sat on the potty before bed, he peed AGAIN! He totally gets it, and starting tomorrow will be in big boy underwear. I'm a little nervous, but totally excited because he is ready to be a big boy, and this mommy is ready to not have to do as many diaper washings per week! I'm not going to lie, this kid lives for 1 thing. Candy (M&M's to be specific). So yes, we are going to be using the reward system with potty training. I'm not saying it's the only way, or that it is even the right way, I just think that it will work for my son. I'm excited for this new adventure, because he is totally ready. Hubby and I just need to help him get there. Wish us luck this week, while we don't want to push, we want to encourage and guide. We fully feel that he is ready, we are just hoping that we are and that we don't go crazy in this new phase of spending half our days on the potty with him. In close relation to my goal for this year, as well as my word. I have decided to dub this year's goals/growth as Project 13. Since it is 2013, I am going to come up with 13 things to help me engage in life and succeed in my goals. I have several DIY projects I have been eyeing on Pintrest, some big, some small. I am not going to commit to any as of yet, as it greatly depends on our budget, but I am going to do at least 5 DYI's this year! I know who my 5 people are, however I am not going to share with you who they are (because some of them may better read this blog). Let's just say I am going to pick 5 people and pray for them and attempt to spend more time connecting with them this year. I'm really excited to have a project and an action plan to help me succeed in my goals for this year. How are you doing on your long term goals? Do you have an action plan or a specific way to achieve them? In the past I have chosen a word for the year. It has been something I want to focus on, a rhythm or direction for the year. I haven't done it in a few years, and just a few short weeks into this year, I have had a word that has been impressed in me that I can't shake, so I have decided to make it my word and goal this year. As I shared in my goal's for this year post, I wanted to engage in life. Since writing that goal, that word has permeated my heart. I need to be more engaged in my life, more intentional about the way I spend my time and how and when I do things. This year I am going to engage life, take it head on and be distracted by meaningless things less. I'm excited! Do you have a word that you want to take on this year? I'd love to know what it is, please share in the comments! 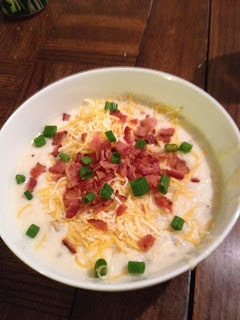 Here is what our family plans on eating this week. I really need to get back in the habit of menu planning. I have fallen off of the bandwagon in that department, and I really need to make it more of a weekly habit. Hope you are all having a great week! It is so easy to see a long list of tasks and feel super overwhelmed by it. The TO-DO'S in a busy home never stop. So what if we rethink how we go about making our list? What if we actually made it possible to do it all? Here are some tips to making your list a "can do list"! 1. Write it down. I'm serious, no more mental lists, you will forget something, just write it down! 2. Keep it short. This isn't an EVERYTHING that needs to get done in history list, it is just things to do today. Create a separate long term list. 3. Star ONE TASK as the most important. Know that if time runs short, that is the one you focus on and need to finish. 4. Number them in order. Sometimes the floors may be the most important thing to do, BUT we all know you should do counters/dust before floors. Number those things that must be done in order, it helps. 5. Reward yourself. If there is a particular task you HATE doing, then reward yourself when you complete it. 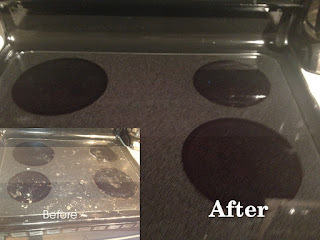 Seriously, you hate scrubbing out the oven? Then spend 30min with your feet up watching your favorite sitcom! Complete your entire list? Celebrate with a private dance party! Seriously it works! Even just calling your list an I Can Do It list, will help to motivate you and put you in a better frame of mind for your daily tasks. Remember, that YOU CAN DO IT! So stop reading my blog, and make your list today, do it and reward yourself. ...and I would like to spend as much time with her as scheduling allows. This picture is from the last time we hung out 1.5 years ago, far too long! This girl time is very needed, so my usual days/times that I devote to blogging this week will be greatly condensed. Hope that you all are having a wonderful week. This is one of the chores I hate doing, I will admit it. We currently do not have a dishwasher, and my son goes through 4-6 bowls and 3-5 plates PER DAY, that is not counting the 3 plus cups. As I am typing this here are 3 bowls and two cups on the table still waiting for me to clear and wash, just from dinner/post dinner snack. 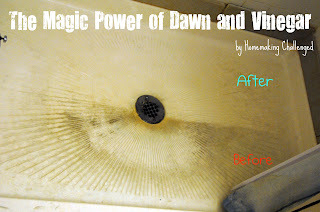 However doing the dishes daily I have found, will give you a sense of accomplishment as well as a fresh start. Both are things that every homemaker needs, every day. I can hardly believe that it is now 2013. Where has the time gone? I feel as if I have finally just gotten the hang of writing 2012 on everything and now it is time to write 2013. I hope that you all had a very happy holiday season. I apologize for my silence during the holidays, but our family has had a bit of a shake up and some crazy things happen the last 5 weeks, on top of the standard holiday crazies. I will share the details with you later, know that our family is healthy and happy, just going though some stuff right now. Looking into the new year, it is always exciting to see the hope for things to come and reflect on the blessings we have received. The first half of this year was full of blessings as we celebrated welcoming our sweet baby girl into the world as well as purchasing our 1st home. We are incredibly blessed to have amazing family and friends as well as an incredible church. No matter how crazy life is, nor the challenges that will come this next year, we will choose to remain thankful for the wonderful things that we do have. As is customary for me on the 1st day of the month, I will be posting some goals that I have, and sharing an exciting new way for you to join in and create new routines and ways for your to make your home run more smoothly, and become less challenged as a fellow homemaker. 1. Read through the Bible in a year with my husband. Our church is doing this program and I'm excited to be a part of it. I've read the Bible many times, but I've never done it on a "program" or "schedule" or with a group of people. I'm really excited because my husband and I are going be reading this together each day. I have multiple area's of my life that I am looking to improve being a better wife, mom, homemaker, blogger etc. As well as work on getting my physical body closer to my pre-baby days. This also means working on the many wonderful insights I gained by reading this book, as I discussed in last month's goal post. I'm excited to share my journey with you and this year may we all become less homemaking challened!